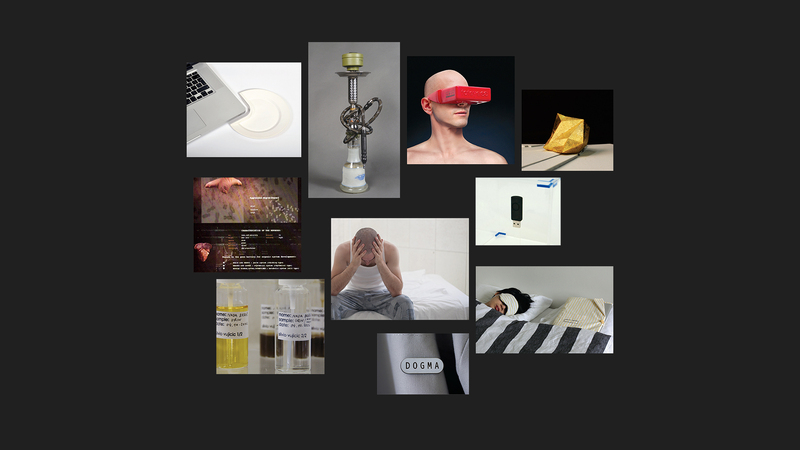 This project is a continuation of the research initiated with the exhibition Design Fiction: Eutropia – Introduction to Speculative Design Practice, held at the the Croatian Designers Association gallery in May of 2015, and published in an accompanying educational booklet titled Introduction to Speculative Design Practice – Eutropia: a Case Study (published by the Croatian Designers Association and the Arts Academy in Split), which offered an introduction to this design practice and summed up the basic specificities and characteristics of this particular design approach, providing initial mapping of the Croatian speculative practice. Recent examples of speculative design practice are rare in the Croatian context. In the local context, there is no apparent and powerful historical reference to and continuity of such practice. That is why the objective of this project was to simultaneously contextualize and present a number of significant contemporary speculative works by Croatian authors who, although they themselves would not use this term, belong to the field of speculative design. Eight of the following authors works were selected: Lina Kovačević, Robert Čanak, Anselmo Tumpić, Nikola Bojić, Damir Prizmić, Ivica Mitrović and Oleg Šuran, Nina Bačun and Anders Mellbrat. Two works, initially not nominated as design works, have been additionally included since they belong to accompanying speculative practices ( Andreja Kulunčić and Silvio Vujičić). All selected works have a common feature: they actually do not have a distinct or specific (Croatian) approach to the speculative practice, instead, they reflect global influences (both in the approachand methodology). Therefore, we consider this selection, although it encompasses mainly Croatian authors, as an overview of global speculative practices. For that reason, the works are accompanied by info diagrams that present methodological specificities as well as specificities related to the design process itself. In the selected works speculativity can be interpreted on four different levels or in the light of four different components: as an incoming discipline and a specific approach (or school), methods used and themes represented. Multidisciplinarity, or to be more precise, removing borders between traditionally defined disciplines makes one of the basic characteristics of speculative practice. In addition to the speculative design, the selected works include approaches inherent to various other disciplines/practices. Andreja Kulunčić (A Closed Reality: Embryo) uses the approach of contemporary art practice, Anselmo Tumpić (Tateye) opts for product design and advertising, while Nina Bačun (Man-Machine Affairs) investigates through human-computer interaction (HCI) and interaction design. Specific approaches of different schools 36 are also evident. For example, Nikola Bojić (Felton Street Emptiness) uses the Harvard approach focused on the public domain (social and political dimension). Lina Kovačević ( A Set For An Online Romantic Dinner) reflects the British or London approach to the speculative practice characterised by a subtle aesthetics in the creation of a narrative atmosphere. Nina Bačun and Anders Mellbrat (Man-Machine Affairs) uses the Scandinavian approach based on the research process. With their Mediterranean approach (“from the edge of Europe”), Mitrović and Šuran (Southern Comfort) approach dystopian scenarios common to the speculative practice, from a humanistic position. Speculative design practice mapped by the traditional design process. DISCOVER AND DEFINE PHASE: refers to generation of ideas / concepts / design space (abstract speculations), and related approaches. DEVELOPMENT PHASE: refers to concept development, and related tools, techniques, instruments, methods, genres, concepts. DELIVER PHASE: refers to materialization / explication / communication / presentation in various formats. Methodological flexibility and openness, as one of the main characteristics of the speculative practice, is clearly evident in the selected works. Speculative future, as the main approach to the speculative practice (DS), is the foundation of the majority of the works, which use narrative scenarios as tools for constructing initial abstract speculations (DV), but also for its communication (in the textual form) (DL) (Hybrid Gulf – Excavating Future Identities, Eutropia and Southern Comfort). In addition to speculative futures, “critical design” is, in the narrow sense of the term (as defined by Dunne and Raby), also a rather common approach in the research part of the design process, that is in the definition of the design space. The Perfume uses a critical approach (DS) by linking the space of a gallery to a research laboratory and emphasizing the significance of the partnership between designers ( artists ) and scientists. Speculative projects that successfully communicate ( DL ) always involve the organisation and implementation of the dialogue between experts and the public as an integral and indispensable part of the process ( A Closed Reality: Embryo ). 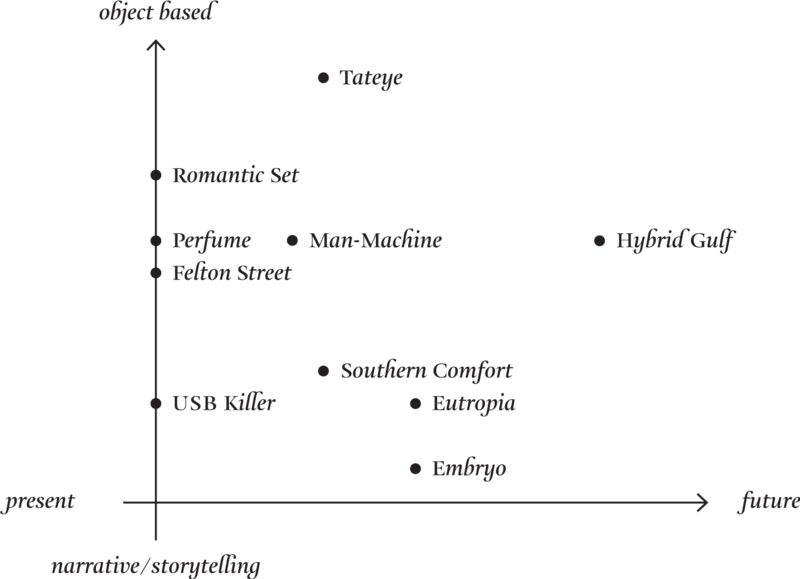 Design fiction is certainly the most commonly used genre in the development of speculative concepts ( DV ). Eutropia, for instance, communicates a fictional scenario in the popular form of a narrative fictional video ( DL ) with the corresponding visual code and costume design ( DL ). We can see a similar approach ( setting the scene and working out a correlated fictional costume design ) in Man-Machine Affairs ( DL ). A Set for an Online Romantic Dinner and Tateye speculate about future consumer markets using “diegetic objects” for the materialization of narratives, and communication aiming at the suspension of disbelief about possible futures ( DL ). Interviews, questionnaires and discussions, as methods used in the social sciences, appear to be important tools in the development of concepts ( DV ) and getting feedback from the audience ( DL ) ( Man-Machine Affairs ). Hybrid Gulf – Excavating Future Identities uses archeology of the future to develop the concept ( DV ) and museum artefacts to materialize it ( DL ). On the other hand, Felton Street Emptiness uses contemporary artistic practices as a speculative method ( DV ), whereas USB Killer ( as a part of the broader concept named Objects of Dangerous Intentions ) employs pop-culture pat- terns, as a particularly interesting genre in the speculative practice, to speculate about the near future using the phenomenon of urban legends ( DV ). The selected works also identify some of the main themes challenged by speculative projects. Eutropia questions the ubiquitous technology in the urban environment and the relationship between an individual and a hybrid city. A Closed Reality: Embryo and The Perfume both deal with issues of biotechnology, one in the context of genetic engineering, and the other by using do-it-yourself approach. Set for an Online Romantic Dinner and Tateye cross-examine the limits of freedom of the future markets through the lens of consumer technology. Eutropia and Southern Comfort deal with the new economic models and social orders. From the position at “the edge of Europe”, removed from the European urban and technology centers, Southern Comfort addresses discursive issues within the design practice itself ( the so-called “Western melancholy” ).